When I started blogging, I got so excited for every new Twitter follower and Pinterest re-pin. “People like me, they really like me!” I would think to myself. Just as quickly, my mood would crash when I checked my blog traffic stats. “Maybe they don’t like me at all and my content is crap,” I’d think to myself while moping on the couch, pity-eating Cheetos. I checked my marketing metrics multiple times a day because I thought that’s what a business owner was supposed to do. And also because I thought the stats would show me exactly how to explode my business growth. I was totally wrong. Stats and analytics aren’t a magic bullet. Checking them multiple times a day is a waste of time. Plus, if you’re tracking the wrong information you’re not going to grow your business effectively. Are you tracking the wrong marketing metrics? Many of the analytics advice and spreadsheets out there recommend that you track social media followers. If you run a six- or seven-figure business and you have a clear social media marketing strategy, then it might make sense to track your followers. If, on the other hand, you’re a solopreneur who’s doing everything herself, tracking followers is a complete waste of time. Here’s why: If your goal is to get 1000 followers on Instagram or 250 new fans for your Facebook page, you are working on the wrong things. Your time is too valuable to waste on something that is proven to have very little ROI. You need to create great content and paid products. But when you track the number of followers you have, your priorities get skewed. Instead of working on the tasks that make you money, you’re scrounging to add a few more followers. In an ideal world, one in which you have thousands of hours a week to grow your business, it would be fine to focus on follower growth. But in the real world? You don’t have time for that! Want to skip right to the good stuff? Grab a free copy of my tracking spreadsheet and make sure you’re tracking the right metrics! Social media followers are an example of vanity metrics. Vanity metrics make you feel good, but don’t help you make strategic decisions about your business. For example, when your Instagram followers increase, you get that bright, happy feeling that people like you! You might also feel like you’re making progress in your business. But vanity metrics don’t actually move your business forward. Growing your followers doesn’t tell you which kind of posts resonate with your audience (so you can create more posts like that). Adding new followers doesn’t help you develop irresistible offers for your audience. Those followers? They only matter if they are engaging with you, joining your email list, and eventually buying from you. I know! It feels like blasphemy to say this in the blogosphere. Pageviews matter if you are trying to attract advertisers, or if you want a general sense of how your website is doing. But tracking overall traffic or pageviews doesn’t show you how to make more money. See above. Anyone can buy followers on social media or join those “Like for Like” threads on Facebook and get random fans who don’t see your posts and definitely don’t buy from you. Yes, engagement matters. But it matters less than a lot of other things. The trick here is to be very clear about your goal. If your goal is to attract more email subscribers and you know that the people who comment are more likely to join your list, then track the number of comments you get! If you’re tracking comments for the heck of it, then stop! The blog post that I’ve made the most affiliate income from? It has 0 comments! If you’ve been tracking vanity metrics, don’t feel bad! I’ve done the same thing. I also don’t want you to think that traffic, followers and comments don’t matter at all, they do. But you don’t want to build your business around them. There are more effective marketing metrics you should look at. Get started using my tracking sheet here. Above all else, track your income and expenses. You run a business, for crying out loud! Let’s make sure that business is making you money. Here’s a rundown of the metrics I track, and the questions I ask myself each month when I review my numbers. Am I making money? And if so, how? What is selling well, why do I think that is, how can I leverage it to sell more. Do I still use all the tools I pay for? Am I making more than I spend? What content is resonating with people? Can I create more content like that? With whatever social media platforms you use. For me, I’m just tracking in Pinterest. Repins don’t really matter. Click-throughs do. Which posts are getting clicked on, and why do I think that is? Can I create more content or more pin graphics like those? To track click-throughs in Pinterest, click on “Analytics” at the top of the screen, and then on “Clicks” in the menu bar below. On that page, we can see that my posts about time management and organization are getting the most clicks. Some of the pins are ugly and not well-branded, but they still get tons of clicks. This tells me that the content and headline resonates with people. Now I know that I should continue to focus on time management and organization posts. I also see that I should optimize these posts because Pinterest sends a lot of traffic to them. Which opt-ins have a high conversion rate? Are there any on my site with a low conversion rate that I should get rid of? Can I create more opt-ins with a high rate? Here’s an example from my ConvertKit dashboard. Notice that the pop-up is converting at less than 1%. That’s terrible! It’s not worth bothering readers with a pop-up to get a few subscribers, so I’m going to turn that opt-in off. On the other hand, the Simple Blog Business Plan form is converting at over 24%. That’s a great conversion rate, especially for a content upgrade! I’m going to promote that post heavily and keep using content upgrades to grow my list. How many people are opening my emails? Which subject lines are getting the highest open rates? If my open rate is dropping, is it time to clean out my list? For example, in this small selection of emails, I can see that the subject line “Back to school treats for bloggers and solopreneurs” had a much lower open rate than the other emails, including a few hard sell emails when I was pitching the Solopreneur Success Bundle. My theory is that people don’t expect me to talk about “Back to School” things because I’m not a mom blogger and school doesn’t have much to do with my niche. I think people just ignored that email and then started opening again when I went back to the kind of headlines I always use. Now I have a better idea of what headlines people will open in the future. Most of my sales come through my email list, so I want to track list growth. Am I reaching my goals? What causes certain spikes in the list growth? How can I leverage what’s working and drop what’s not working? In September, I can see that I had a few days when my subscribers spiked. When I click on each colored band in the chart, I know which opt-ins were popular on those days. It turns out, people are joining my email list from content upgrades in my blog posts. That strategy is definitely working for my list growth, so I’m going to keep doing it! Ready to stop stressing about traffic and start tracking the stuff that really matters? 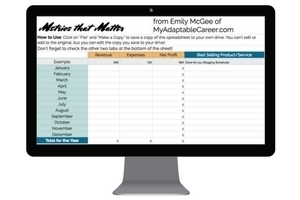 Download a copy of Metrics that Matter, my free tracking spreadsheet for solopreneurs. Grab Metrics that Matter: a free tracking spreadsheet! Great! Check your email to get the spreadsheet! Don’t worry, I’m guilty of it too! Everything just feels so neat and tidy when you can compare numbers from month to month. The funny thing is, I’ve found that my traffic and email subscribers might stay the same, but my income goes up. Or I might post 5 times in one month and 1 time another month and my traffic stays the same. So, I guess my point is that those metrics don’t actually mean much, at least not for my business, and probably not other people’s either! I totally agree with the points in this article. Most bloggers focus on just traffic and fail to take care of important facts like Email list, conversion etc. Thanks for sharing these insights.